Superman is back in the pop culture lexicon (did he ever leave, though? ), so I think I can safely say that something is ‘my kryptonite’ and everyone will know that it kills me. Right?! Well, here goes nothing: LOVE TRIANGLES ARE MY KRYPTONITE. I’m seriously allergic to them. It used to be that I could tolerate this now-dreaded young adult romance cliché, but too many bad experiences have scarred me. Or maybe I’ve just lost patience like the old grouch that I am (on the inside). The sad truth is that there are *very* few exceptions to this rule, and Shana Abé’s The Sweetest Dark was not one of them. Lora has grown up in horrible circumstances – she was found mute and with no memory of her past on the street at age ten, and from thence deposited in an orphanage. She heard music that no one else did, and was sent away for a stint in a mental institution. She’s become very good at appearing normal ever since, but so far she hasn’t turned hard. That doesn’t mean she isn’t damaged in other ways, though. When the Great War starts and London is bombed, Lora gets her one golden opportunity – she’s sent to the coast to an exclusive school for girls far above her station. It is there that she will find mysteries beyond the ordinary, and two very different young men. 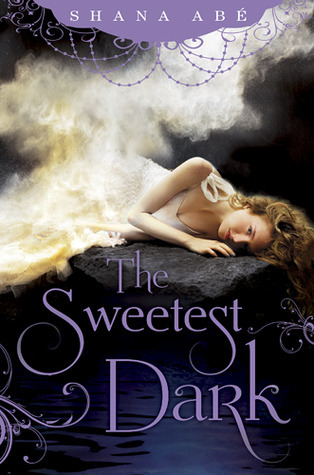 I picked up The Sweetest Dark on Liviania’s recommendation – we’re practically reading twins, and so I usually try what she thinks is good (and vice versa). She loved this book, so I read it. Easy peasy. There were certainly things I liked about the book. Abé started off with quite a hook – a girl who hears things, and doesn’t know why, and a (separate) mysterious old story told in anonymous letters. I was invested immediately, and intrigued by the gothic feel of the narrative – it reminded me a bit of Jane Eyre, actually. Recommended for: fans of young adult historical fiction and fantasy, anyone with a thing for dragons, and those who liked Juliet Marillier’s Wildwood books or Libba Bray’s Gemma Doyle series. Sorry this one didn't work for you due to the love triangle! And the extraneousness is the worst part of them. It's always obvious which guy is getting picked, so why does the second guy have to be in love too? But I love that you mentioned "impending doom." I think impending doom is one of my narrative weaknesses. (See this book, The Raven Boys, et al.) I just love that sense that things are going to go horribly awry. You kinda weirdly sold me on this one - I think my library has a copy, so I'm gonna check it out!